Janis is the person who is willing help you to achieve your goals and dreams. He brought up in a small town, where everyone had "small town" mentality, but Janis always was looking for ways to grow and think bigger. He always thought differently from others. While friends were searching for job, he was out starting his own journey, businesses and trying different ways of creating passive incomes, so he could live his dream lifestyle.After high school Janis started to invest in his personal development (read books, listen to seminars) about success, mind power, how to produce wealth and passive incomes.By the age 22, Janis wrote his first e-book: Think Grow Succeed: 7 steps to Money and Wealth and created 61 day plan workbook, where you create your most important goals of life and achieve them. 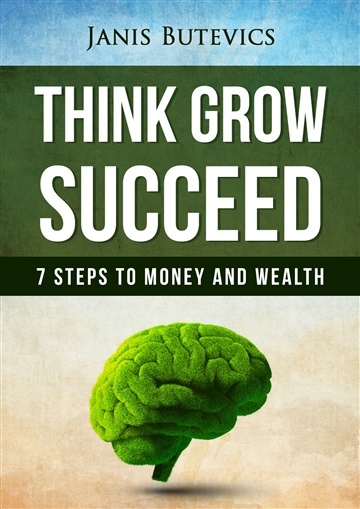 There he share all of his knowledge how to Think, Grow and Succeed. Janis is really passionate about sports, he is also a member of YSOP International. He invite you to read and use his e-book as a resource to improve or change your life to better side!